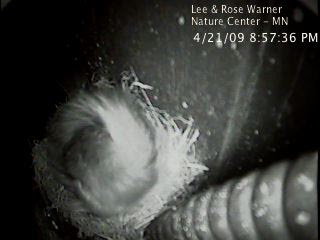 I checked out the internal link tonight to the phoebe cam at work. The feed is not yet live to the public. That's up to Cornell to decide on. They won't go live until we see eggs. Check this out though. At 9:00 tonight I went to the feed and saw this image. What is that? It looks like a curled up red squirrel. 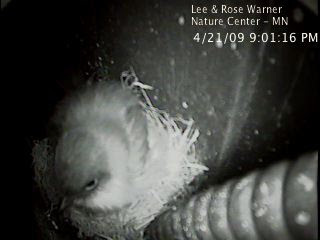 I went to the feed because I was curious if the female phoebe was spending the night on the nest. That would be a good indication that eggs might be in the works. I refreshed the feed and it just twitched a little. Finally, after about a minute it switched to this. I refreshed again and finally I got this image. Woo hoo! 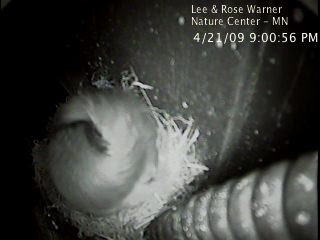 The phoebe is spending the night on the nest. I would not be surprised to see an egg in the morning. She quickly went back to sleep. I wonder what woke her up?